Pictured here is Craig Martin of Horizon Capital, together with Chloe Jones and David Fulton of Safika BSS. Horizon Capital has secured a valuable tenant for one of its high net worth clients at Eaton House, a recently developed AAA-grade sectional title office development in Century City. The tenant, Safika Business Solutions and Services (Safika BSS), is a Managed Services provider focusing on the provision of products and services in office automation and production printing. Safika BSS has a national customer base including corporate clients such as PRIMEDIA and the Peermont Group, as well as government clients such as the National Treasury. 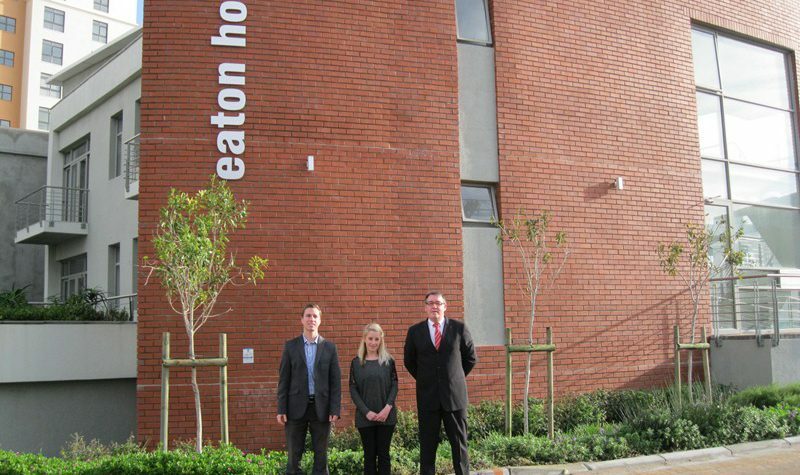 Eaton House boasts upmarket office space with a focus on energy and water efficiency, thereby securing significant operating cost savings for all tenants while providing a productive and desirable working environment. Horizon Capital provides a complete, integrated and personalized property investment and management service for clients wishing to hold directly owned portfolios. Should you be interested in investing in commercial property in Cape Town contact John Witter on 021 425 8586.